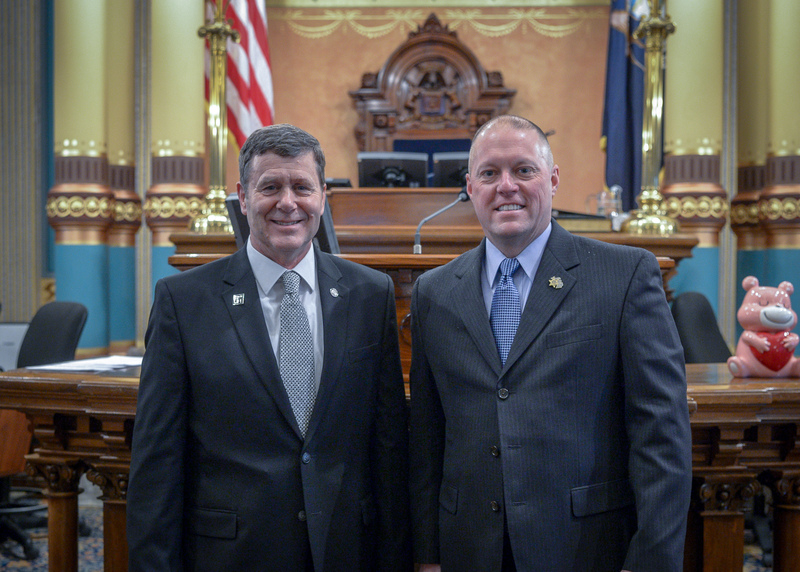 LANSING, Mich. — State Sen. Kevin Daley, R-Lum, welcomed Bay County Sheriff Troy Cunningham to Lansing as his guest for Gov. Gretchen Whitmer’s 2019 State of the State address on Tuesday. Editor’s note: A print-quality version of the above photograph is available by clicking on the image or by visiting the senator’s website at www.SenatorKevinDaley.com. Click on “Photos” under the “In the News” tab. Photo Caption: State Sen. Kevin Daley, R-Lum, is joined by Bay County Sheriff Troy Cunningham on the Senate floor prior to Gov. Gretchen Whitmer’s 2019 State of the State address.